Thera revives Xander, and, with much grace, suffers Xander's insults. She has awakened him to rescue Tefler from the Fire Stratum, and then to take Tefler into Kairos before it winds down. She sends Xander with a gift, an eye replaced with rose crystal. Cook investigates a hull breach that opened on the bridge of the Serapis. Xander appears and tells Cook of his mission, and his plans to have Zadok restore Astlin. They go to the auxiliary bridge, where Queen Navkin of Avalon has assumed her station at the Wheel. She hands over a Guild Regulator to help locate Tefler in the Fire Stratum. Xander flies a nexus runner into the Fire Stratum. He recovers Tefler, but angers a host of fire elements that attack the ship. The imp Th'ix grabs Xander, and teaches him the needed Working to escape the Fire Stratum. Navkin introduces herself to Tefler, her grandson. After talking him out of killing his mother, Navkin tries to correct Xander's misunderstanding of Thera, before changing his plan to serve her own purposes. Xander and Tefler walk the halls of Kairos in search of Vaun Mordechai's sword. They raid his quarters on the Exodus, back before the Cataclysm. They use it to sever Zan's life cord, and then consider using it to end Astlin's suffering. But rather than lose his love, Xander would confront Zadok and have him return Astlin to him. As Kairos runs down, Tefler and Xander are confronted by Szodrin, who reveals himself to be known by other names: Faerda, Teth, and Zadok. Overwhelmed by meeting his god, Xander begs zadok to give back Astlin. Zadok judges her instead. Thera appears, releasing Shaiel into Kairos. Zadok would judge all creation, and tries to force Thera and Shaiel into their assigned tasks. The divine siblings rebel and assault Szodrin. While they distract Szodrin, Xander rams Vaun's sword into Szodrin's chest. The last gears of Kairos grind to a stop. Zadok arises and pronounces his judgment. As Souldancer closes, a few questions linger. Are the rest of the nine souldancers going to join Vaun, Elena, and Astlin in the pantheon? And what connection does Almeth Elocine have to Zadok and now the Zadokim? What connection does Zadok-Teth have with Teth, the Void equivalent of prana? Rose light accompanies Thera's powers, gold light with Shaiel's, and now blue light with the Zadokim's. While it brings to mind cyan-yellow-magenta coloring, where any color can be created by mixing the three colors, perhaps the white light of the Nexus might be prisimed into more colors and factions. If I had one issue with Souldancer, it is in the constant face-heel turns. Not that there were so many, but there wasn't time to let each switch from villain to hero to villain linger long enough to fully register and see the consequences or origins before the next hit. It was a bit like car crash TV, and by the end, was getting whiplash keeping track of who was on what side. As mentioned earlier this month, Souldancer is more accessible than Nethereal, but that comes at the expense of some of the uniqueness of its prequel. I have not read anything like Nethereal. Sure, I recognize some of the ingredients, but the arrangement defies categorization. Souldancer can be more easily slotted into the premade boxes of genre as a metaphysical fantasy splashed with a gloss of science fiction. And, as a metaphysical fantasy, it delivers what The Wheel of Time promised but never truly realized: a story that shook the pillars of Creation and left it transformed. Most attempts at such fail because they marry grand shakings in the spiritual realm to world-wide conflicts and geopolitical movements. A fatigue sets in, because the author has to order the chaos on earth and in the heavens. 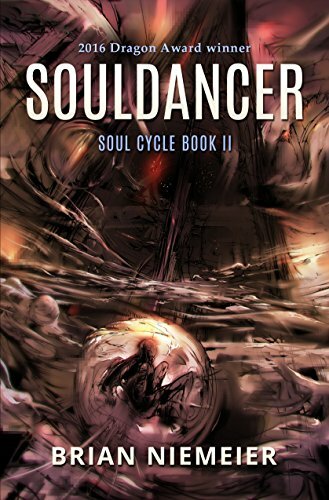 Souldancer limits the scope of the earthly realm's conflict to Xander's pursuit of Astlin. Boy meets girl, boy loses girl, boy shakes the pillars of heaven to get her back. Those stakes are personal, and relatable to the reader in a way that Rand Al'thor's never were. Check out this preview of The Secret Kings, where we find out what Teg Cross was up to in the years since the Cataclysm before he runs into another familiar face. Great summary, as always, Nathan. Thanks for helping out with this one. It really added to my enjoyment. And since we're at the end, I'll go ahead and list all of the souldancers who've appeared on stage as of SD's finale. I wasn't sure if Elena counted as part of the nine. If I might ask, is there a souldancer of the Middle Stratum? Elena isn't one of the nine (neither is Szodrin). I was just listing all of the souldancers who've appeared in the series as of book 2. There isn't a souldancer of the Middle Stratum because all of them were created there, and the soul rifts always tear through to a different plane than the subject is on.